What the shitting hell is this? Originally created by The Joker, Batzarro is a bizarre clone of Batman. There are many things about Batzarro that make him diametrically opposite from the Dark Knight, including the upside-down bat symbol on his chest, use of guns in battle, and his "futility belt." The most notable difference, though, is Batzarro's villainy - murdering couples who walk down Crime Alley. Although he idolizes Batman, Batzarro couldn't be more different from the heroic Caped Crusader. When I chose, up above, to express my anger through the rare use of vulgarity, I wasn't asking who Batzarro is as a character - I already knew that. I read "With a Vengeance" when it was coming out, so I'm covered. No, the question was more about why, out of all the myriad possibilities they had available to them, Mattel would make a toy of this. In addition to all the diametric opposites listed in the bio up above (as well as a few others, which we'll discuss in just a moment), there's another difference they neglected to mention: since Batman is highly observant, Batzarro has no eyes in his mask at all. The figure duplicates that feature nicely, as well as the big, McGuinness-y chin and the smile full of fangs. Wait, he smiles? That's another huge difference! 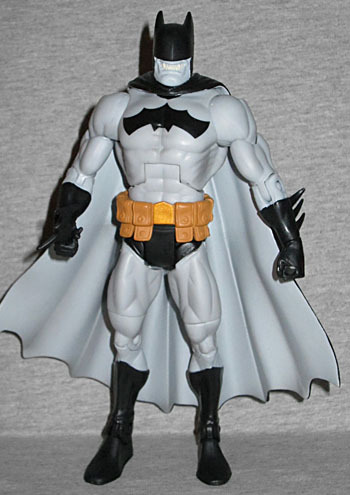 Below the neck, Batzarro is mostly identical to the DCUC1 Crime Stopper Batman - same Medium Male body, same pointy gloves, same angled boots, everything. 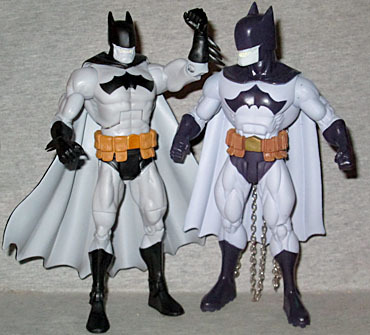 It makes sense, since he's meant to be a copy of Batman, but when you remember what Mattel did with Bizarro, it's disappointing. 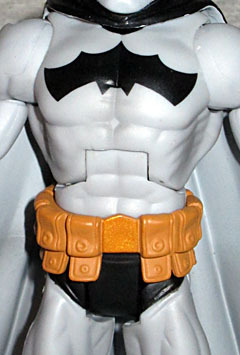 Of course, Batzarro does get a new belt - his Futility Belt, as it's called. True to the comics, it's a pouchy style belt, rather than capsules, but it's upside down, the flaps are all open, and if there was ever anything in the pockets, it's all fallen out. I unironically love that little touch. It's so perfectly "not-Batman," you know? Also, the fact that his bat symbol is upside down (because if you just flipped it sideways, like Superman/Bizarro, it would look the same). What they did forget, though, are the chains. Batman is a stealthy master of the darkness, right? So being the opposite of that, Batzarro naturally wears shiny, clanking chains at all times! (He also narrates his every thought out loud, rather than keeping everything private.) We never saw how the chains attach to him in the comics - they just seemed to emerge from behind his back - but this toy is missing them. Even the DC Direct version got that right, and that was nearly seven years ago! 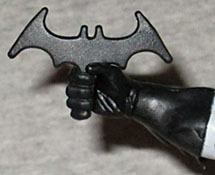 Batzarro comes with a batarang that I initially thought was one of the ones DCSH3 Batman came with, but is actually a different sculpt. It's got a short spike at the bottom, and harsh angles on the wings. There isn't anything particularly "Batzarro-ish" about it, but what could they really have done? It's your toy, put it in his hand upside down and call it a day! Of course, if they'd really been paying attention, they would have given him the same guns that came with Red Hood. The bio even talks about the fact that he uses guns! Sadly, since the DC Signature Collection didn't get enough interest to continue next year, this may be the last time we get one of these cool Mike Thompson back-of-the-box portraits. At a glance, this could easily just be Batman: there's nothing extreme about the pose, just the character standing there in a ¾ths pose, with his left leg bent slightly, and clutching his batarang (bizarang?) in a way that the actual toy can't manage. But then you notice his lack of eyes (and a forehead that really looks like the carapace of a xenomorph), the inverted batsymbol and the futility belt, and you know something's wrong. The stitches on his costume are large and sloppy, just like Bizarro's were often shown. And to give you a final sense that there's something wrong with him, his mouth is twisted off to the side slightly, rather than properly aligning with his head. It's inhuman! Batzarro isn't really a bad figure, but it's an awful way to end the DCSC line. It's a character nobody wanted, and not significantly better than the DC Direct version from years back - yes, Mattel's has the edge in articulation, but DCD's has the chains, so at least its costume is complete (also a sculpted chest symbol, if you like that). If you want a Batzarro toy, get that one. But the real problem is that four months ago we said that Mattel had until the end of the year to prove they weren't as stupid as everybody always says they are, and they failed to meet the challenge. That was four opportunities to release Ice, and instead we go out on a character that could have been put in the Batman Unlimited line (or whatever it's named this month). Way to live down to expectations, Matty Collector.